Who doesn’t love a puppy? They are utterly adorable and give us a healthy dose of oxytocin. What’s not to love? Well, maybe those sharp, little shark teeth….all that puppy nipping and biting! Our new puppy Cailie is bringing to mind all the former puppies we’ve had and how we’ve channeled that puppy energy and mouth to other objects. It’s self-preservation, mind you! Puppies explore the world with their mouths. 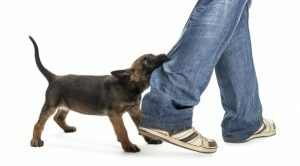 If they’re not checking out every, single nook and cranny of your home to see what new and exciting item or object may be there for their entertainment, the pup is likely using those little shark teeth on your pant legs, your shoes, your calves or when jumping, even your knees! Even with the best of management, when you have a puppy, then you surely have at least a few nicks and cuts on your hands or arms from those little shark teeth. 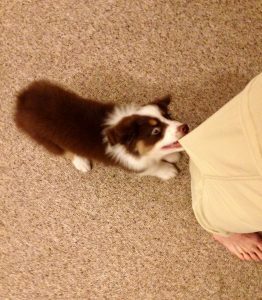 It’s vitally important to help your puppy learn what “to do” vs. always trying to stop the nipping and biting. Management to the rescue! Management means manipulating the puppy’s environment so that the pup can’t practice the unwanted behavior (in this case puppy nipping and biting) which sets the puppy up to “get it right.” If the puppy “gets it right,” she earns reinforcement and reinforcement is what makes a behavior more likely to happen again. Got it? Reinforcement helps YOU get more of the things YOU want from your puppy! Puppy Proof Your House: I’ve never had two-legged children, though I know parents child proof a home – same for your puppy! Clear your floors and tables of anything that could be tempting or dangerous to your puppy. Use pet gates to prevent the puppy from getting into “off limit” areas. Temporarily put away all small rugs and door mats (so tempting for a pupppy!). Have a plethora of “legal” chew items that you puppy can enjoy. In our home that’s Nylabones, rugged chew toys, such as Kong toys, Outward Hound Invincible toys and other assorted stuffed animals with squeakers. And fleece tug toys. Refrain from thinking an old shoe or sock will do the trick. The puppy doesn’t know the difference between a new shoe and an old shoe. Pick up ALL shoes and put them out of reach. Shoes are really stinky. Yes, even YOUR shoes are stinky! Dogs love stinky. Place your shoes where the puppy can’t get to them. Wear tight legged pants. Think about your feet, ankles and calves from the puppy’s perspective. Your feet are always moving and to a puppy, that’s an opportunity to chase. Take it from me. In the first few days Puppy Cailie was in our home, I was lounging around in some lightweight, cargo pants with very flowy legs. Bingo! The cuffs of those pants were a target for her little sharky mouth! By wearing tight legged pants vs. pants with flowing legs, there’s less movement around your ankles which will help diminish chasing. You notice I said “diminish,” right? 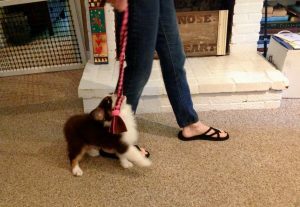 It’s not going to totally prevent the puppy from grabbing at your legs, but it will certainly be beneficial in the long run. Once I switched to tight legged jeans, her chasing diminished. Anticipate and be ready to redirect. All puppies will chase feet, however, an Australian Shepherd puppy like Cailie is bred to nip and chase. Accept the breed characteristics of your pup and be ready to train her “to do” what you want. That means being ready to offer up something else BEFORE she latches on to your feet, ankles or pants. Thank Heavens for long tug toys! I have several long tug toys that I carry with me each and every time I move through the house or out of doors when Cailie is following. If she starts bouncing toward me with her “Oh, I’m about to grab your leg!” look, then I offer up the tug toy. She happily grabs it and off we go. She’s happy. My legs are spared! She’ll eventually let go of the tug toy when her focus shifts to the next interesting thing or movable object. Other times we play a game of tug, then I get the chance to “trade” her for a piece of food which helps her learn to drop something that she has in her mouth. Exercise and mental stimulation. If we could only bottle that puppy energy! That energy need to go somewhere. If your puppy has enough exercise and mental stimulation, you’ll experience less puppy nipping and biting. We’re fortunate to have seven fenced acres to walk and roam. Our morning and evening off leash walks are a wonderful way to provide both physical exercise, as well as mental stimulation. Think about all that sniffing! Be sure to provide some safe, off-leash exercise for your puppy. If you must walk on leash, think about doing sniff walks where you let the pup explore with her nose. Ball pits, a designated area where the puppy can romp and play with multiple balls, are fabulous for enrichment. Another fun idea is an inexpensive clothing hamper with the bottom cut out. It can provide hours of entertainment and also helps develop confidence. Know your puppy’s arousal level. With too much play your puppy’s arousal level can hit the roof. For our puppy, Cailie, that’s when we see more of her nipping and biting. Become observant of how long it takes for your puppy to ramp up in excitement. Learn when to interrupt a play session before the pup tips over to fractious behavior. You can take a short training break and work on impulse control exercises (sit and down) or give the puppy a chew item, such as stuffed Kong, to help disperse that energy. The last hurrah (or puppy bewitching hour). With every puppy we’ve had in our home and every client puppy we’ve had the pleasure to work with, there seem to be a few predictable times a day when a puppy will move over their arousal threshold, even with the best observation skills in regard to the level of arousal. When that’s the case, those sharp jaws are in overdrive! Be ready to prevent the fractious behavior by doing a short training session, a romp in the ball pit, providing a stuffed Kong or other chew item or by using any number of food puzzle toys. Train your puppy. Puppies are little sponges and while they have short attention spans, they learn so very quickly. Each and every moment with your puppy is a chance to reinforce what you like or redirect her to something of YOUR choosing, thereby helping her make wise choices that please you and please her. When I get up in the morning, I don my treat pouch and am ready, willing and able to reinforce her for all the great choices she makes during the day. My favorite behaviors to teach a new puppy are Focus and Attention, Sit, Down, Leave It and Trade. If you teach your puppy to Focus on you, then you have a chance to then be able to begin training other behaviors. Teach first, then train. Sit and Down are impulse control exercises (oh yes, puppies can use a bit of that). Leave It helps the puppy learn to move away from some delectable object and look back at you and Trade teaches your puppy to willingly give up a prized possession the little one managed to get into her sweet little mouth. All of these behaviors are very useful in our own household right now. Example: now that Cailie will sit immediately when I say the word “sit” (the verbal cue), when she’s about to get into something or is bounding toward my leg with “that look” in her eye, I can cue her to “sit” which prevents the unwanted behavior. I have given her instruction on what “to do” and, of course, she gets reinforced for that! Puppy Cailie is 11 weeks old and has only been in our home for three weeks. With the daily focus on training, she’s pretty stellar with these training exercises. I set aside three to five minutes each day to formally work on the above exercises. 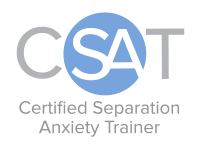 Keep your formal training sessions short. Puppies have short attention spans, so quit while you’re ahead. Keep them wanting more! Remember, however, that learning happens 24/7, so be ready to catch your puppy doing what you like, reinforce her with a yummy piece of food, and you’ll be surprised how quickly she learns!